Less than 30 days from now on June 20th, the 301 Endless Yard Sale (100-miles) will open and will become the largest yard sale in North Carolina history. What started as an idea from retailer Tommy Abdalla and Selma Mayor Cheryl Oliver has morphed into a multi-county event that grows every day. New vendor locations are added each day and families, churches and non-profits join in the excitement to host this event. Patterned after several existing yard sales, like the World&apos;s Longest Yard Sale held in August each year running from Michigan to Alabama along highway 127, we have goals for our sale to expand to the state&apos;s borders within the next two years. We have since discovered more than ten sales that join communities together with this favorite pass-time -- yard-sales or junking! One of our favorite names of area sales is the Peaches to the Beaches Yard Sale down in Georgia...the name alone is just fun! 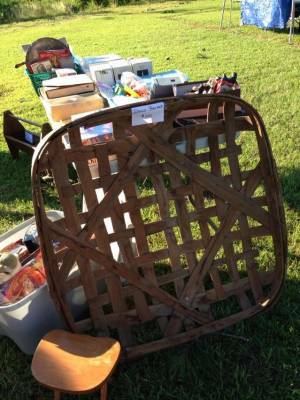 It&apos;s not a new idea and we didn&apos;t "invent" this wheel, we are just riding the wave with thousands of yard sale enthusiasts. Our 301 Endless Yard Sale planning committee has been meeting since January with representatives from Roanoke Rapids, Wilson, Johnston County towns along US 301 and Dunn. Each month we find more and more businesses that want to be a part of the event, restaurants are gearing up for massive sales, and hotels are offering special rates for visitors traveling here to either bring their treasures for sale....or treasure hunters headed here to see if they can do the entire 100-mile stretch. Brochures have been distributed, classified ads are running, banners have been printed -- everything is moving towards a huge turn out! We have had inquiries from the media -- just how many vendors will you have along US HWY 301? How many people attended last year -- and how many do you expect this year? Great questions. Last year just in Johnston County, we estimated more than 150 vendors and the number of participants was in the 1000s. The highway was literally bumper to bumper for two days. So this year we are encouraging more parking at vendor locations to move vehicles off the highway and are letting local law enforcement/EMS and service businesses to route their deliveries along I-95 and not US Highway 301. How far did you travel to the sale? City, State demographic information. Did you stay in a local hotel, campground, or stay with friends and family? What would you suggest to the organizers of the event to make it better? Look for some fun social media contests during the event with Facebook posts for the best "buy" during the Yard Sale, with prizes from the destinations for winners. This event is coordinated by the local Convention & Visitors Bureaus in Halifax, Wilson, Johnston and Harnett Counties with several town officials to provide services like signage, vendor coordination, and special event permits. A special thanks to everyone that makes this event happen -- just a few more weeks to go!!! !